Hello! Henley P. here, Teton’s cousin. I’m here to talk about a very serious subject: Fireworks, aka Boom Sticks. My family doesn’t know too much about how I react to fireworks, because they haven’t had me for a full year. We had a few at New Year’s, but now that it is almost the Fourth of July and we live in an area where they are allowed, we are learning that I am not a fan of the fireworks. They started up last night around 11:00 PM. I was already sleeping in bed with my mom, but there were LOUD NOISES, so I started shaking, whining, panting, and trying to squish under the covers with my mom. So we got up and got my ThunderWorks ThunderShirt. What is a ThunderShirt? According to the website, the ThunderShirt applies ”gentle, constant pressure [that] has a dramatic calming effect for most dogs and cats if they are anxious, fearful, or overexcited.” It’s the same idea as swaddling a fussy infant. 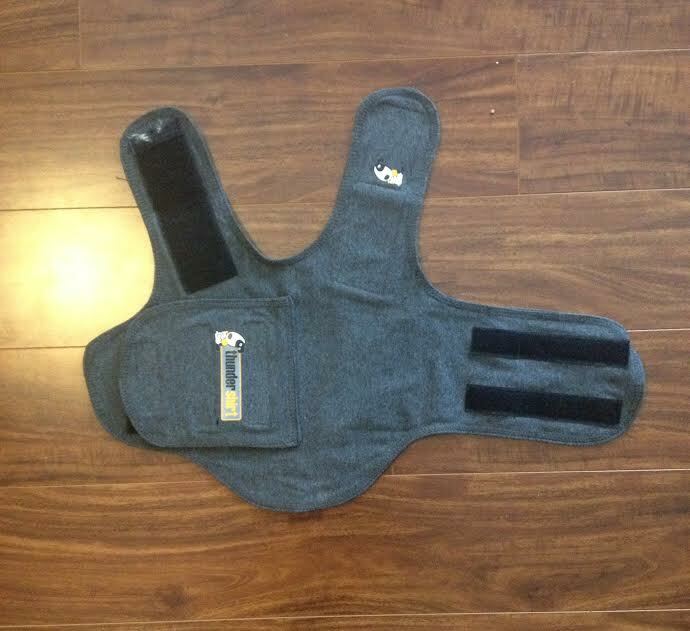 The basic ThunderShirt is gray, breathable knit jacket, with several lines of Velcro to ensure a snug fit. 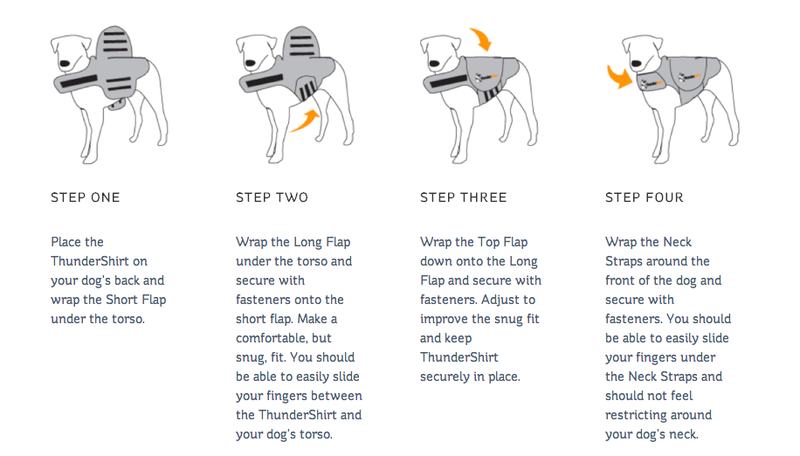 The website has great directions, with diagrams, on how to fit the ThunderShirt on your dog, but once you do it a few times, it’s easy to get the hang of it. 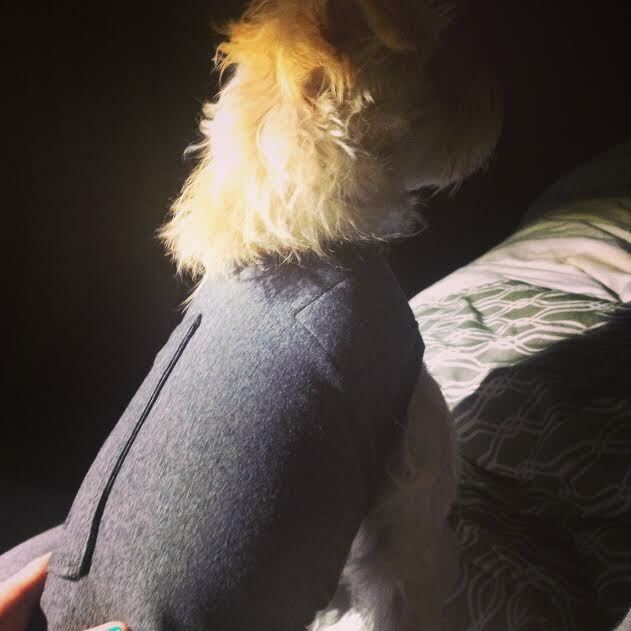 So, Mom put on my ThunderShirt, Instagrammed a photo, and we were off. After maybe, at most, 10 minutes, I was snuggled at my mom’s feet in my ThunderShirt with my stuffed monkey. No shaking. No whining. No squishing my mom to the edge of the bed. Mom was worried about leaving the ThunderShirt on while we slept, but ThunderWorks says it can be left on for extended periods of time and that some dogs wear the shirt all day while their people are at work. Mom fell asleep, but then when she woke up, about 2 hours later, she took the ThunderShirt off and I slept perfectly fine until it was time for breakfast in the morning. ThunderShirts may not work for every dog, but they definitely work for me! I’ll probably be wearing it for the next week or so, until the boom sticks die down. ThunderShirts are available at most pet stores and online retailers for about $40. I’d recommend going to a store to try it on and have the staff show you how to get the best fit for maximum effectiveness. 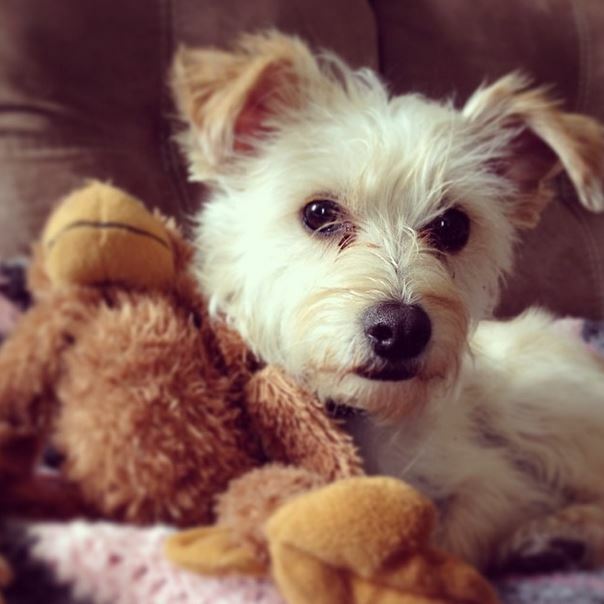 Thanks for the guest post, Henley P.! Posted on June 30, 2014 by Shannon	This entry was posted in This 'N' That. Bookmark the permalink. Yay Henley P! That thundershirt really does work. I, and H.P., am glad we have it! I have never heard of these jackets before. What a great thing to know about, because my dogs simply hate storms. I’m so excited to read about this. Thanks for posting how they work and the success you have had with them.